DIE Lunæ, 14 die Octobris. King's Answer to the Address of Thanks. 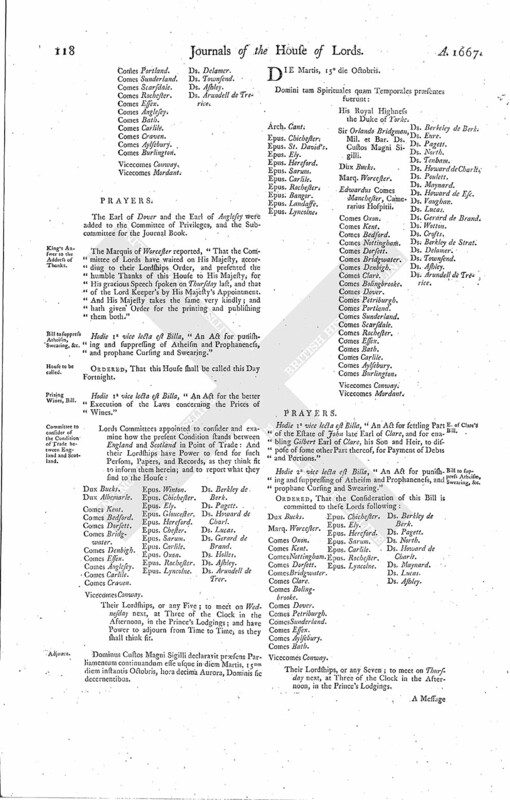 Bill to suppress Atheism Swearing, &c.
Committee to consider of the Condition of Trade between England and Scotland. Epus. Lyncolne. Sir Orlando Bridgman, Mil. et Bar. Custos Magni Sigilli. E'wardus Comes de Manchester, Camerarius Hospitii. 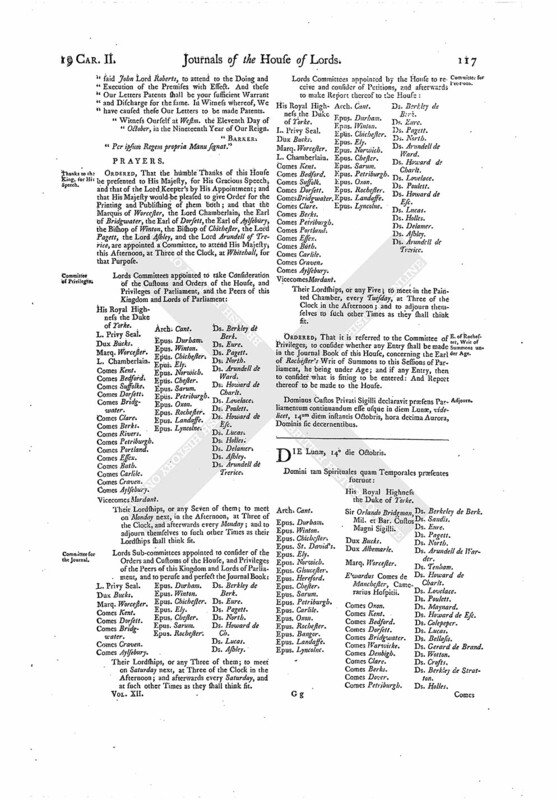 The Earl of Dover and the Earl of Anglesey were added to the Committee of Privileges, and the Subcommittee for the Journal Book. The Marquis of Worcester reported, "That the Committee of Lords have waited on His Majesty, according to their Lordships Order, and presented the humble Thanks of this House to His Majesty, for His gracious Speech spoken on Thursday last, and that of the Lord Keeper's by His Majesty's Appointment. And His Majesty takes the same very kindly; and hath given Order for the printing and publishing them both." Hodie 1a vice lecta est Billa, "An Act for punishing and suppressing of Atheism and Prophaneness, and prophane Cursing and Swearing." ORDERED, That this House shall be called this Day Fortnight. Hodie 1a vice lecta est Billa, "An Act for the better Execution of the Laws concerning the Prices of Wines." Their Lordships, or any Five; to meet on Wednesday next, at Three of the Clock in the Afternoon, in the Prince's Lodgings; and have Power to adjourn from Time to Time, as they shall think fit. Dominus Custos Magni Sigilli declaravit præsens Parliamentum continuandum esse usque in diem Martis, 15um diem instantis Octobris, hora decima Aurora, Dominis sic decernentibus.